Pakse or Pakxe (French Paksé; Laotian ປາກເຊ [pȁːk séː] "Mooth o the river Se") is the caipital an maist populous ceety in the soothren province o Champasak, makin it the third maist populous ceety in Laos. It haes a population o aboot 87,000, situatit at the confluence o the Xe Don an Mekong Rivers. It an aa served as the caipital o the Kinrick o Champasak till it wis unified wi the rest o Laos in 1946. This ceety wis foondit bi the French as an admeenistrative ootpost in 1905, an wis formerly the caipital o the Lao Kinrick o Champasak till its abolishment in 1946 whan the Kinrick o Laos wis fairmed. Durin Franco-Thai war French cede Pakse tae the Thais authority. The ceety served as the primary seat an residence tae Prince Boun Oum Na Champassak, an important figur in the Laotian Ceevil War. He biggit Champasak Palace but fled in 1974 afore it wis completit. In Mey 1975, it fell tae Pathet Lao forces. Syne 1975, Pakse haes acome an economic pouer an o regional importance within the region an the construction o a brig ower the Mekong (biggit wi Japanese aid), allowin road traffic wi Ubon Ratchathani in Thailand, haes further integrated the ceety wi neighbourin kintras. Pakse is home tae mony ethnic Cheenese an Vietnamese fowk. The ceety population predominately practices Buddhism but haes a Catholic kirk. The ceety haes the Champasak Provincial Museum, which haulds heestorical documents an artefacts o the province. Thare are twa hospitals locatit within the ceety, ane is the seicont biggest o Laos, but mony ceetizens traivel athort the border tae Thailand tae receive better treatment, as thay are better equipped. Thare is a heich risk o Malaria an dengue fever durin the monsoon saison. Pakse is locatit alang Naitional Road 13, the main transportation highway o Laos. It haes the brigs ower the Xe Don, the French an the Roushie Brig, an ane brig ower the Mekong River, the Lao Nippon Brig, anly ane o five brigs ower the Mekong in Laos. 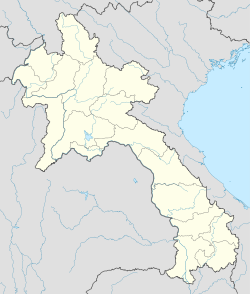 Pakse is the gatewye tae the Bolaven Plateau, as well as tae the soothren provinces o Salavan, Sekong an Attapeu. It is served bi Pakse Internaitional Airport. The Pakse airport finished construction on November 2, 2009, resumin flichts tae Vientiane, Siem Reap, Ho Chi Minh Ceety an Bangkok. Pakse haes a tropical savanna climate (Köppen climate classification Aw) wi very wairm temperatures throughoot the year. Temperaturs are especially heich in the months afore the monsoon saison (Mairch-Aprile). Thare is a distinct wet saison (Aprile-October) an dry saison (November-Mairch). ↑ "Pakse Climate Normals 1961-1990". National Oceanic and Atmospheric Administration. Retrieved January 11, 2013. Wikimedia Commons haes media relatit tae Pakxe. This page wis last eeditit on 11 Mairch 2018, at 05:19.